Due to many and repeated questions and misunderstandings on camera-based observation of the lunar crescent aka "crescent imaging" aka "CCD technique" we have prepared a description of the technical aspects, also in comparison to visual observation. Crescent imaging (aka "CCD observation") is an observation technique of the lunar crescent using an electronic camers instead of the human eye. The camera captures the direct light from the crescent and forms an electronic image from the resulting data, which is then being enhanced for better visibility and displayed on a computer screen. The overall process is quite similar to modern live-television. The light captured by the camera is direct light from the crescent (which is actually scattered sunlight) just as the human eye sees it. This is NOT any kind of thermal glow from the moon. The range of colors of light detected/used by the camera can be easily restricted to the range visible to the human eye, but could also be chosen to extend somewhat to the near-infrared light for better brightness and contrast. In both cases the structures visible are basically the same as with human vision. This similarity can be easily demonstrated when observing easy crescents. Because of the advantages of the cameras and the contrast enhancement techniques used the imaging approach can usually show more difficult crescents on the computer screen than the human eye can see. Under very favorable (and very rare) weather conditions these advantages allow to image the lunar crescent quite close to the sun, sometimes even at the moment of conjunction. These few observations at conjunction were done in broad daylight under excellent weather conditions and with the moon high in the sky. Such observations would be far more difficult if not impossible after sunset. Despite its advantages this technique is still limited by the usual weather aspects such as clouds, haze and dust.  When the sky is cloudy or very dusty, then this observation technique will also fail to show the crescent, just like visual observation. Even though lower contrast can be resolved than the human eye can see the technique is NOT all powerfull. Live video and documentation of the observation, "proof"
Crescent imaging creates a live-video of the crescent on the computer screen (offline methods are out of date) and simultanously creates a permanent documentation with images/videos from the observation. This data provides a more reliable result, a quantitative "proof" of having observed the crescent, than visual observation can provide. There are many cases of obviously false visual sighting claims of the crescent (eg. claims to have seen the moon long after moonset), but there are (as far as we know) no cases of false crescent imaging claims and these would be far more difficult to fabricate. The live-video from a single crescent-imaging system could easily be broadcast on TV, letting thousands participate in the observation and see the results. This is not possible with actual visual observation which happens inside the observers eye/head. Using a TV camera to capture an easy crescent near the horizon must also be considered an imaging technique, even though TV often tries to capture a view similar to human vision. A crescent imaging system has a certain complexity and cost and requires a moderate level of skill and experience to use. This hurdle will get smaller over time but still this approach will probably not be available/possible for every single person as basic naked eye observation is. On the other hand broadcasting the live-observation could allow others to participate who are unable to join in visual observation for reasons such as restricted mobility or bad local weather. Optical lens to form the light from the crescent into an image on the camera sensor. This is usually chosen similar to telescopic viewing. Digital camera to convert the light of the image to digital data using a CCD or CMOS sensor. Monochrome cameras are usually used here. Computer screen to display the resulting contrast enhanced image from the digital data. The optical parts could simply be put on a static tripod but are usually operated like an astronomical telescope, tracking the calculated position of the moon. Imaging can show fainter crescents, e.g. showing the crescent sooner after conjunction. Both approaches are limited by the weather conditions. The visual observer sees the direct light from the moon. 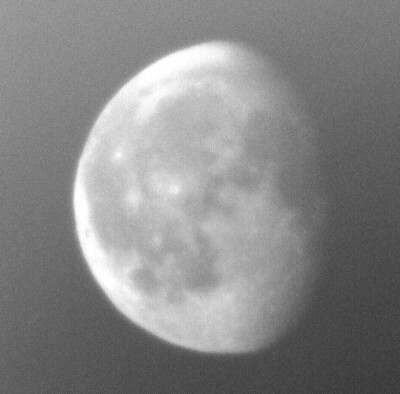 With imaging the camera captures and measures the direct light from the moon. The observer looks at a computer screen and sees the representation of the processed image-data from the camera. Good eyesight or experience with telescopic viewing is not required for crescent imaging, but very important for visual observation. Visual observation only uses visual-light. Imaging can also use near-infrared light, which provides more brightness and better contrast, but shows the same structures as visual-light. Inexpensive optical filters ("colored glass") can be used to restrict the light the camera sees to the naked-eye spectrum. Visual observers spend some time looking for difficult crescents before they can be certain they have seen it, even though it might be very faint. Imaging systems also spend some time to capture the resulting images/videos by combining many short exposures to get a clearer image. Imaging creates videos, images and documentation as technical "evidence". Visual observers are more like eyewitnesses and have been known to make very astounding errors. The video from an imaging system can be instantly shared world-wide. This is not possible with visual observation, where you only have the report of the observer to share. Imaging is more difficult and more expensive than visual observation but probably also more cost efficient. CCD and CMOS are just two slightly different technologies for the actual image sensor. Inexpensive CMOS used to have disadvantages for our task but that seems to be changing. We use monochrome CCD cameras for the task, with resolution between 640x480 and 1392x1040. These cameras are NOT intended for night-time astronomy, but can deliver a high framerate of raw data, which is what we need for the task. Using an astronomical GoTo mount to find and track the moon is required for the most difficult crescents. Daytime observation attempts require great care to avoid the dangerous glare from the sun.